Registration:Separate admission is required for each day of the event. Friday will have Vinylmation and Pins. Saturday is the Pin day. Sunday is the Vinylmation day. Event admission does not include EPCOT admission which is required. Click here for VINYLMATION REGISTRATION. 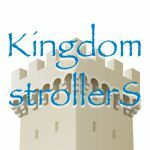 Click here for PIN REGISTRATION. “In a far away land there lived a wicked and vain Queen who wanted more power. While pouring over ancient spell books, she discovered an incantation that, when performed on the darkest of days – Friday the 13th – could bring together thirteen of the most evil Disney villains known only as “The 13.” To cast this spell, the Queen must use a powerful, supernatural object – a magic mirror – to transport “The 13” from across time to the present day. As luck would have it, Friday the 13th will take place in September this year! The Queen decided this would be the perfect day to cast the spell. Exclusive trading time inside 13-Reflections of Evil venue from 8:00 a.m. to 9:30 a.m. In order to register for the Villainous Vinylmation Breakfast, Guests must also be registered for the Vinylmation Showcase. The Villainous Vinylmation Breakfast is not available to Guests who only register for the Pin Trading Showcase. I love the inclusion of the Beagle Brothers. They don’t get on much merchandise. I’m a little surprise they do not have hats. I’m also a stickler when ears are not used well. But they are designed beautifully and are a must have. Great idea for a combo set. Wonderful artwork on Dr. Facilier and I would expect no less from Ron Cohee. The hat looks great and I love the splash of color on the ears. The juniors are a nice companions, fit in with the story and are expertly designed on the 1.5 inch canvas. This is also a great idea for a combo. You get Mim in her normal form and in one of her transformations. Great artwork. This is the least impressive piece of the Reflections event bunch. The face and horns look good, but I just don’t think Maleficent was the right choice for the Minnie platform. i do like how the bow gives the artist the chance to draw that straight line across, but it is an awful lot of yellow up there. For some reason the Minnie body comes across as a dress and not a robe and just looks odd. 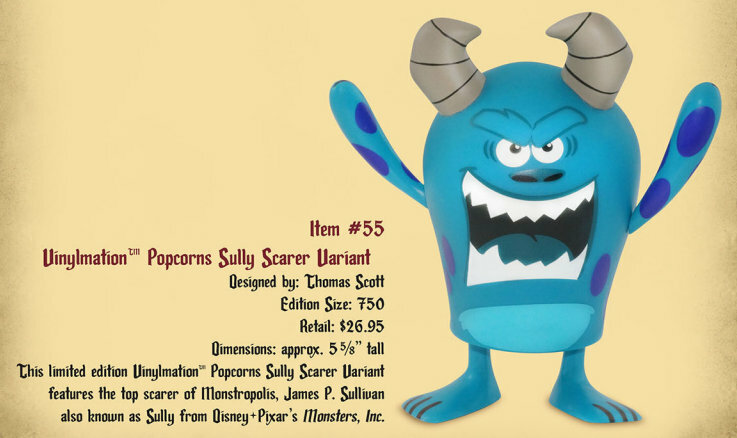 An absolutely wonderful variant follow up to Sully’s original Popcorns figure. I wish this one was the original design released. Oh, forgot Madame Mim. While I can leave the reg Mim, I do like the Dragon variant. Looks so true to the cartoon. Ron Cohee does rock. Facillier and Mim are fantastic, Maleficent is still awful, and the Beagle Boys are ok but with any hats or accessories and bland art work, they’re certainly not worth $35. For that price I’ll make my own. Why Sully? He is not a villain…. Maybe too many of the orginal molds were created and this is a way to sell them. Good luck with the $27 price tag. It appears Friday is both a Pin and Vinylmation day, Saturday solely pins and Sunday solely Vinylmations. Friday has sold out now, as well as the pin breakfast Saturday morning.